Why does airport food taste so awful? A recent trip took me thousands of miles from home with Star Alliance partners Air Canada and Lufthansa. My starting leg was YYZ (Toronto) to LHR (London-Heathrow). I took a morning flight but slept through breakfast. 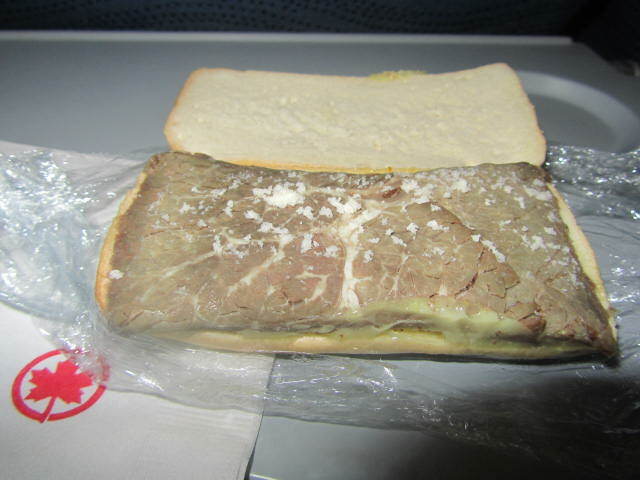 The “snack” was served about two hours before we landed on our seven hour journey. This was a roast beef sandwich served cold. 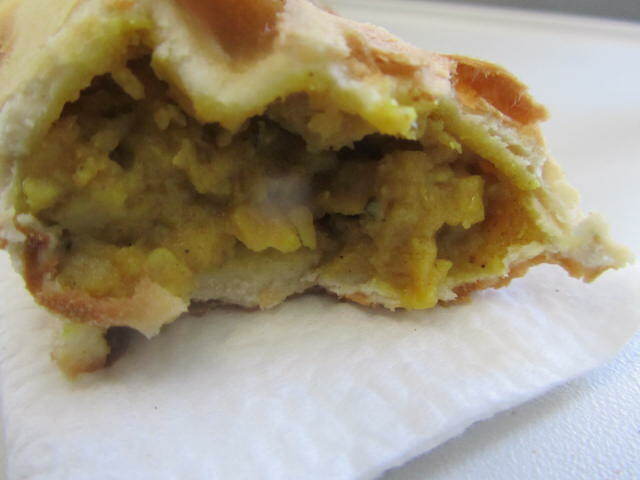 Do you notice that there is some congealed grease on the bottom. I did not even bother to bite into it. A few days later, a continued my trip from LHR to MUC (Munich). This was just over a two-hour flight on Lufthansa with complimentary food and beverage service. I was pleased to find out they serve champagne! Our snack was Chicken Korma. 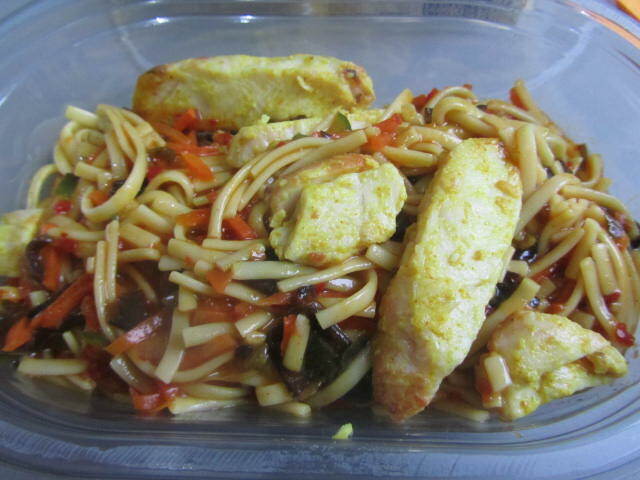 This is usually a nicely flavoured dish that contains chicken with some spices like tumeric and garam masala. This particular item, was extremely bland and so mushy I couldn’t taste the chicken so I gave up after two bites. At this point in my life, I refuse to eat bad food even if it’s freely offered. Travelling from MUC to TLL (Tallin), by way of Lufthansa, was a short flight and the snack offered was a Thai chicken salad with chicken. The salad was served cold and contained noodles and julienne vegetables of carrots, zucchini and peppers and could have been a really good dish except there was too much vinegar used so it was difficult to finish the dish because it was too acidic. But did I mention there was champagne? If you’re wondering, I was sitting in economy class for all my flights and all food and beverage service was complimentary. After a week, my flight home was intense as all my flights occurred in one day through different time zones. As for meal service, I again was served the Thai noodle salad and the chicken korma (that I did not eat) but I consoled myself with some bubbly on both flights. When I made it back to Heathrow, I boarded an Air Canada flight to Toronto. Settling in after take off, I was looking forward a nice glass of champagne. Should I have been surprised that they do not offer it on their flights?! I was quite disappointed and found myself longing to be back on a Lufthansa flight. 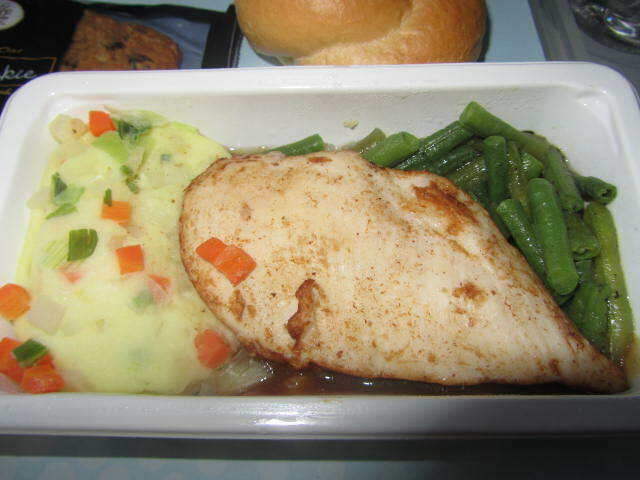 The meal they served was chicken with green beans on the side and mashed potatoes with chopped vegetables in it. The chicken was plain, the green beans were overcooked and the potatoes were mashed. There is not much more I can say about this meal. You know, its amazing what a bit of seasoning can do to improve the taste of your food but I was thinking I can’t wait to get home and eat something tasty. 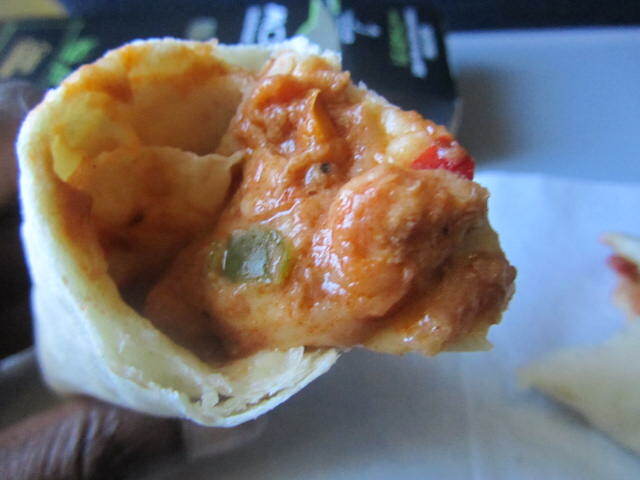 Our snack was a Cajun chicken wrap. Miraculously, this was good! It was a warm wrap with Cajun spiced chicken, red and green peppers. It was flavourful with a bit of a kick to it and I would have had two if there were any leftovers. Aesthetically, Lufthansa food looks updated and modern compared to Air Canada’s food that just looks unappetizing. As for how it tastes, that’s a hit or a miss. Is there anyone out there who has had a great meal on a flight somewhere? I would really like to know what airline I should be flying. For now, I have to look forward to the destination and just tolerate the journey and what it entails….unless there is champagne! !